In this steep competitive market, if you are aiming for a scintillating career, then you have to think beyond your graduation level. Because being a graduate will not help you to secure your position in the market. That’s why students are nowadays, showing their keenness for higher studies. In order to fulfil their dreams, they are now appearing in various competitive exams so that they can reach the zenith of their success. GATE (Graduate Aptitude Test in Engineering) is one of the most popular competitive exams for science and engineering students those who are planning to pursue an M.Tech, ME or post-graduate degree in their respective subjects. Science and engineering students across the country are gearing up for GATE 2017 so that they can enrol themselves in the IITs and other prodigious institutes. If the aspiring candidates can score well in this competitive exam, then on the basis of that they can select their colleges or institutes. As they are reaching close towards the exam date, most of the students do have butterflies in the stomach and they are bound to be worried and panicky. The stiff competition definitely creates shivers down the spine of the candidates. Cracking GATE is not at all a facile job because this exam demands a lot of preparation, hard work, proper planning and time management skill. If a student possesses all these qualities, then he or she will certainly crack the exam with good score. Below, we are mentioning some tips how you can prepare yourself for GATE and how you can earn a good score in the exam. It is true that the preparation time for GATE depends on various factors, like individual’s skills, knowledge, aptitude, attitude, adroitness, speed, concentration level, etc. If you can diligently prepare yourself for four to six months, then there is a high chance of cracking the exam. But the preparation time may vary from student to student. During your preparation, you should follow the syllabus completely and keep the focus on previous years’ papers so that you can better understand about the exam pattern and start preparing accordingly. You should possess a profound knowledge of your subjects because most of the questions asked in the GATE exam will test your in-depth knowledge regarding your subjects. Since all subjects don’t have equal marks, so you should give priority to those subjects which will help you to score more marks in the exam. You must prepare a list of topics which you need to be studied thoroughly based on the number of questions that have appeared from those topics in earlier GATE exams. You should identify those topics which have fetched more marks and give more priority to them during your preparation. Make a time table for each topic and try to follow it firmly. While studying any topic, emphasize on key information like definitions, equations, formulae, derivations, theorems, etc. You should allocate preparation time to each subject based on the number of questions asked of them in former GATE exams. You can check out the do’s and dont’s for those who are self-studying for GATE 2017 here. Aspirants who take preparation assiduously for last one year for GATE, they don’t need to do so much in the last one month. But that doesn’t mean that you can ignore this last one-month preparation because preparation of this last one month actually creates a huge the difference between the students. This last month preparation is actually the deciding factor for your GATE exam. Below, we are making a list of tasks that you need to complete your last month preparation. Is there any subject that you didn’t prepare well so far? If yes, then identify it and take a quick look on it. Have you gone through and solved all previous years’ questions of GATE? If required, try to solve them again so that you became more confident and poised. Are there some questions that you didn’t solve earlier or left them for the last month preparing? If yes, then identify them because this is the right time that you need to solve them. Have you properly revised the entire GATE 2017 syllabus so that you can reminisce all important formulae and equations without any help? If possible, try to look at all the important theories, formulae, laws once again. Have you prepared all engineering mathematics and general aptitude appropriately? If you are not confident about these two, then this is the high time to gain your confidence back. Have you checked your accuracy level for solving both theoretical and numerical problems? If you feel that you are not much equipped in solving numerical problems, then in this last month keep more focus on solving numerical problems. Have you reduced your silly mistakes utterly? Because negative marking is there for GATE exam. If you want to score well, then try to minimize your mistakes as much as possible. Otherwise, you will not be eligible for any good college. So, in the last month you should try to polish your accuracy level. Have you solved any mock paper design for GATE 2017? If not, then try to give mock tests as much as possible during this last month. So, basically, in the last month, don’t try to experiment with any new thing rather you should revise all the important subjects, theories, equations, etc. as much as possible. You can check out GATE Exam Papers Lists & Codes here. Any bachelor degree holder (B. Tech, B. Sc, B. Pharma) and those who are pursuing the final year of these programs are eligible for GATE exam. There are basically three sections for GATE 2017. Total time duration of the exam is 3 hours. GATE 2017 Exam consists of both multiple-choice questions (MCQs) and numerical type questions in all papers and sections. A student needs to answer both types in order to score a good result in this competitive exam. These are basically objective type questions and each question consists of four answers, out of which you need to select the right answer. Each question carries either 1 or 2 marks. These types of questions contain no options. Each numeric question carries 1 or 2 marks in all sections. The answer to these questions will be in real number and you need to enter them by using the mouse and virtual keypad. It is also true that there is no negative marking for these questions. There are 23 subjects are listed in GATE 2017 exam. An aspirant can choose any of them, depending on his skill and ability. Below, we are mentioning some of them. If you can log in to GATE 2017 official website, then you can easily get the detailed syllabus and exam pattern of each subject individually. The tentative exam dates for GATE 2017 are 4th February and 5th February, 11th February and 12th February. The exam usually happens on Saturdays and Sundays so that the candidates can easily give the exam peacefully. Though different subjects have different books, below, we are mentioning some of the common books for GATE 2017. So, if you want to success in your upcoming GATE 2017exam, then you need to make a strong and robust strategy which will help you to earn more marks in the exam. Specially in your last month, you do more focus on the revision. During your preparation, you also need to take care of your physical fitness and health. It is true that illnesses certainly become a huge loss of time and moreover, there is no enviable and happy achievement with ill or broken health. So, you should incorporate some healthy food habits and a minimum 8 hours of sound sleep into your daily routine, if you want to conquer your competitors in the upcoming GATE 2017 exam. You can check out benefits of opting for GATE: tips and tricks here. 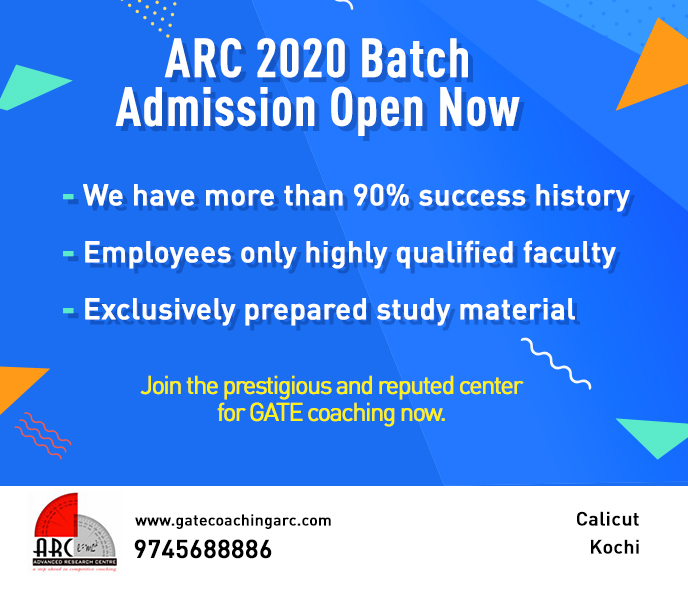 ARC Foundation is the best GATE coaching institute in Kerala and also occupies the initial position in providing best tips for last moment preparation. We are always ready to provide any information related to GATE exams. Contact us for more details.